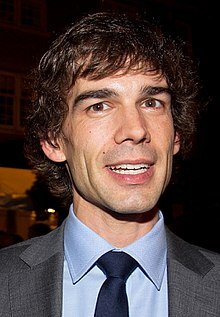 کریستوفر قورهام (اینگیلیسجه: Christopher Gorham) آمریکالی اوْیونچو. ۱۴ آقوست ۱۹۷۴ ‏ ایلینده کالیفورنیا ایالتینده دۆنیایا گؤز آچیب. اؤز تحصیلینی کالیفورنیا، لوس‌آنجلس بیلیم‌یوردودا بیتیرمیش. 1997 Spy Game Daniel / Lucas Episode: "Nobody Ever Said Growing Up Was Easy"
1998 Buffy the Vampire Slayer James Stanley Episode: "I Only Have Eyes for You"
1998 Vengeance Unlimited Jason Harrington Episode: "Noir"
1999 Saved by the Bell: The New Class Mark Carlson Episode: "Liz Burns Eric"
2003 Boomtown Gordon Sinclair Episode: "Monster's Brawl"
2003 CSI: Crime Scene Investigation Corey Episode: "Crash and Burn"
2003 Without a Trace Josh Abrams Episode: "Victory for Humanity"
2008 The Batman William Mallory Voice role; episode: "The End of the Batman"
2011 Love Bites Dale Episode: "Boys to Men"
2012 Hot in Cleveland Casey Episode: "Tangled Web"
↑ ‘Covert Affairs’ Star Christopher Gorham Makes Directorial Debut (EXCLUSIVE). یوْخلانیلیب25 April 2016. ↑ Sean P. Means (February 27, 2018). A sequel to the Mormon missionary drama ‘The Other Side of Heaven’ starts shooting in April. Salt Lake Tribune. یوْخلانیلیبJuly 30, 2018. ↑ Error on call to Şablon:cite web: Parameters url and title must be specified. Screen Actors Guild. یوْخلانیلیبJuly 21, 2010. ↑ Petski, Denise (December 9, 2016). ‘2 Broke Girls’ Casts Christopher Gorham As Recurring. یوْخلانیلیبJanuary 24, 2017. ↑ Petski, Denise (2016-09-28). "'The Magicians' Casts Christopher Gorham; 'Outcast' Adds C. Thomas Howell". Deadline. Retrieved 2017-02-12. اینگیلیسجه ویکی‌پدیاسی‌نین ایشلدنلری طرفیندن یارانمیش«Christopher Gorham»، مقاله‌سیندن گؤتورولوبدور. ( ۲۲ ژانویه ۲۰۱۸ تاریخینده یوْخلانیلیبدیر). قارداش پروژه‌لرده کریستوفر قورهام گؤره داها آرتیق بیلگی‌لر تاپابیلرسینیز. بۇ صفحه‌‌ سوْن دفعه ‏۱۳ مارس ۲۰۱۹، ‏۱۲:۰۲ تاریخینده دَییشدیریلمیشدیر.